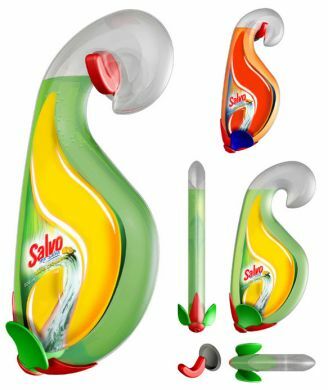 The project contains a new design of packaging for brand Salvo me salva, the liquid dish washing detergent - citron and orange favour. The idea is based on the easier function and attracitve design which gives more ways of usage. The form of packaging is already recognisible "S" taken from the name of the brand. Interesting form of the letter makes easier way of usage - with the practical and minimalistic designed system in the down part that opens the vent for the washing liquid by squeezing the 2 little flippers and closes it when they are released; an upper part of the packaging following the "S" form turns in the fonction of the hook so detergent can be hung in many apropriate places near it usage. There is also the posibility putting it on any vertical surface by sticking the small hook which is the proposed as a part of the product. The material for the parckaging is platic (polietilen), but also it can be made of a gum with the same visual design.